Co-working is defined essentially as shared office space, equipment and services. Paragon Interface, an interior architecture company, is seeing a growing move towards adopting this international trend locally. The major benefit of this trend for employees is that it supports what is termed “agile” working, which is the logical next step of the open-plan office revolution. While traditional open-plan offices still tied workers to individual desks and offered little in the way of shared services or collaborative working, “agile” workspaces allow employees to work where and how they want to, with the full support and functionality required to do so. This encourages exciting design opportunities that will best serve the agile working environment, i.e. shifting away from traditional open-office plans. 1. The open-plan revolution: There has been a key realisation that office-space design must incorporate a social context, with the explosion of technology in recent years enabling this cultural shift. What is needed, is more collaboration and interaction among co-workers, which has resulted in concepts such as “hot desking”, which means that individual employees no longer have desks assigned to them personally, but simply utilise the office space as, and when, they require it. 2. Architectural designs that stimulate creativity: “There are a few key interior architecture principles that underpin effective co-working space design,” D’Adorante points out. Here it is important to design collaborative spaces that stimulate creativity and enable social interactions. 3. Focus time: There is a very real need for private meeting spaces and quiet focus zones to balance all the activity. 5. Design for efficiency: This means creating multiple-use spaces. 6. Adaptable design: This is to respond to changing requirements and technologies. 7. Sustainable architecture: “This is relating to ‘green’ and healthy work environments that support the wellbeing of all staff,” D’Adorante concludes. 1. Discovery Place encourages interaction and collaboration among employees. 2. 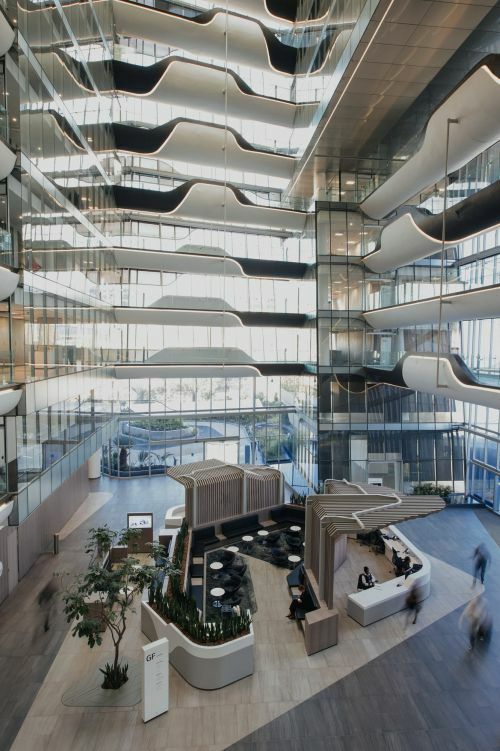 Sasol Place is an example of workplace design responding to the impact of technology. 3. 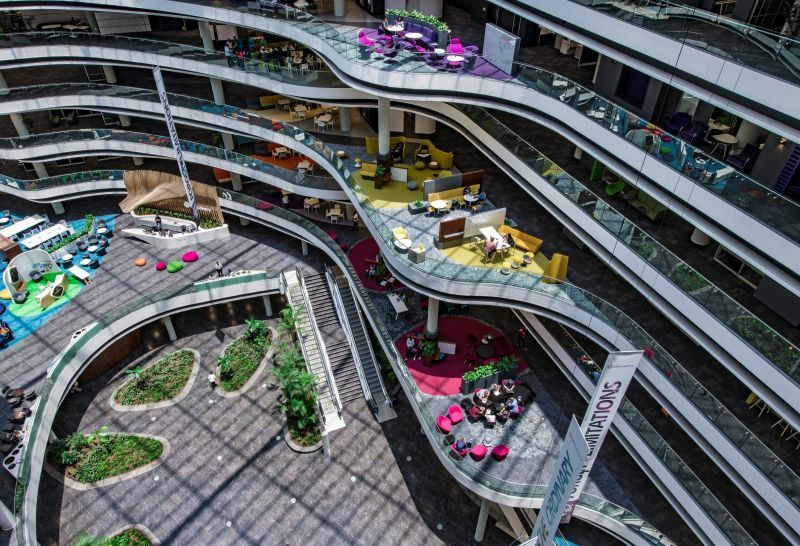 Discovery Place is an example of workplace design incorporating a social context.